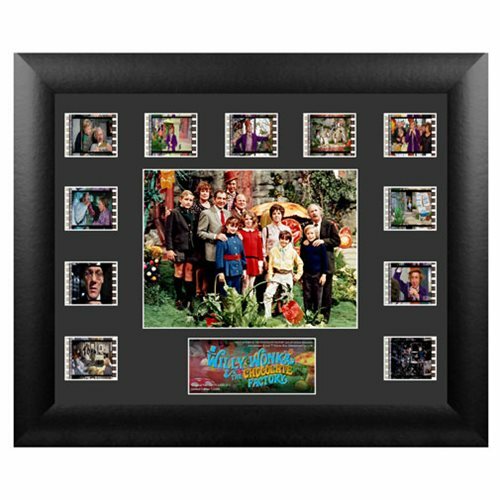 Show your love of the classic movie Willy Wonka and the Chocolate Factory with the Willy Wonka and the Chocolate Factory Series 1 Mini Montage Film Cell! This beautiful film cell presentation features the golden ticket winners from Willy Wonka and the Chocolate Factory. The Willy Wonka and the Chocolate Factory Series 1 Mini Montage Film Cell contains 11 clips of real 35mm film from the movie. Limited to 2,500 pieces. Measures about 13-inches long x 11-inches tall.